I have a theory about fish. And people who tell me they don’t like fish. 1. You have never eaten a good piece of fish. 2. You’ve probably never eaten a good piece of fish that was cooked properly. Today, I’m going to give you a fool-proof, 100% guaranteed “I LOVE FISH! ” recipe. One that will forever change the way you look at fish (as you now know it). Oh, and did I mention this is the most quick and easy, simple and delicious dinner, ever? Mix the sauce in a pan and pour over fish. This takes two minutes. Ready to place in oven. Hurry and make a salad. You’re going to be eating dinner in about twelve minutes. If you are a long time ABK reader, you’ll remember I posted this several years back. It comes via my talented and beautiful friend, Sara. I thought it was worth a re-post, since we have so many new readers now. My kids love this dish. I haven’t met a kid (or adult) yet who doesn’t love salmon prepared this way. One pan, one cookie sheet. If you’re in to bbq, you can grill the fish up in a few minutes outside. Preheat oven to broil, move rack to second level from top. Whisk all ingredients together in small saucepan over medium heat just until butter melts. This can also be done in a microwave proof bowl. Melt the butter and add remaining ingredients. Whisk until smooth. Line cookie sheet with foil or spray broiling pan with cooking spray. Spread sauce on fish and broil 8-12 minutes in oven. Do not turn over. Cook just until fish flakes easily with a fork. -One of the biggest mistakes people make while cooking fish is to over cook the fish. The fish should be barely done. If the fish is done, it will be firm. It should no longer be fleshy looking in the middle of the fish.-You may also grill this on top of the stove. Heat a pan to medium high heat, place a tablespoon of olive oil in the pan (or butter if you aren't counting calories). Cook on each side for about 4 minutes.Cooking time depends on thickness of fish, temperature in oven (how hot your oven broils).When grilling on bbq, grease grill, spread fish with sauce. Cook on one side for 4-5 minutes, then turn gently to other side and grill for 4-5 additional minutes. Alternately, you can make a foil pouch for your fish and cook it on the bbq for a total of about 12 minutes, do not turn over if using foil pouch. 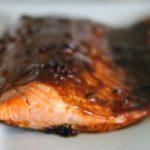 I love fish – and salmon with teriyaki glaze is one of my faves! 🙂 Your recipe looks delish! I also heartily agree with your theory regarding people who don't like fish. 🙂 Cheers! 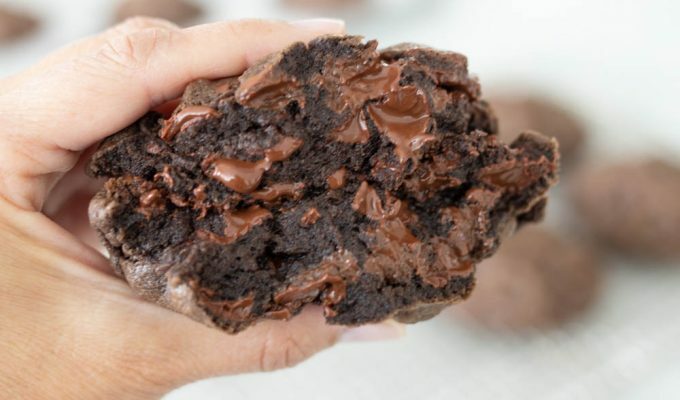 This recipe is right up your alley Bonnie. I know it will become one of your favorites. It’s too bad that there are those who are not fond of eating fish, particularly salmon. I really love it, especially when it’s fresh, since it has more flavor then and quite appetizing. Anyway, thank you for sharing your recipe! I will definitely try to make that one of this days. Cheers! My family is a little spoiled and we have a freezer full of Salmon that my husband and boys catch fresh every summer in Alaska, so we have Salmon on rotation A Lot at our house. My family has grown tired of it. I tried this recipe tonight and it received rave reviews all around. I don’t know if I’ve ever seen my family this eager to finish their dinner. Thank you for adding the excitement back to our fish dinner. What a problem to have! haha. So glad the whole gang liked this delicious and quick recipe! Thank you for your positive feedback and thank you for reading ABK. Hi there! I was just wondering if one batch of the glaze will be enough for a 3 lb. filet of salmon? Yes, I believe so! Let us know what you think after making this recipe Amber. Just wanted to know a couple of things. How much salmon for this recipe and doe you remove the skin before cooking? Thanks. This recipe is plenty for at least three pounds of salmon. I usually buy skinless salmon fillets, but you can also cook with the skin on and serve. The skin adds flavor to the fish as it is cooking.